Historic Cottage. Rural location, 10 mins to train station with direct link to Mt Eden Station for RWC, 15 mins to Piha and 25 mins to CBD. 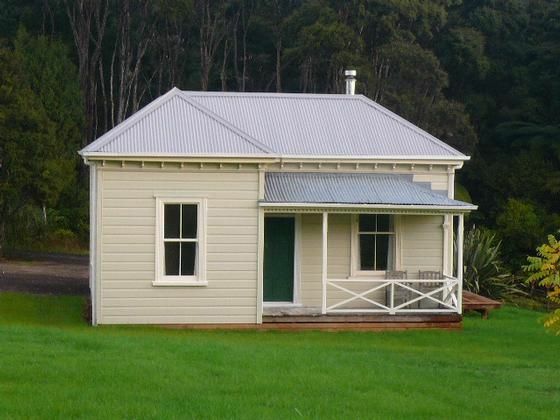 This 2 bedroom Kauri Cottage C.1867 is located in a secluded spot on Carter Road, Oratia. Recently relocated from St Marys Bay and fully refurbished includes: new bathroom; new kitchen; polished floors; insulated; Heat Pump hot water system; Mitsubishi inverter heating, A/C; Smeg cooker with electric oven and gas hob; Shacklock coal range; dishwasher; washing machine; tumble dryer; small deck and veranda; parking for two, one under shared carport. A beautiful location to get away from it all, with access to enjoy all the benefits of the city and Waitakere Ranges. Please note, deposits will only be refunded if cancellation is received within 1 week of arrival and we can re-let the cottage over the same dates. The Puriri Tree Cottage is a gem! We stayed for 2 nights and loved everything about it. The views from every window and the sound of wind in the surrounding trees is beautiful. We will definitely stay at the cottage again. Thank you for staying and enjoying the cottage. I will get the things of note sorted. Thank you for letting me know. Beautiful house, well set up, lovely location. Beautiful house, well set up, lovely location. Thoroughly recommended. We enjoyed our stay at the cottage, very clean and in a very tranquil setting. We enjoyed our stay at the cottage, very clean and in a very tranquil setting. We would stay there again. brilliant location for a relaxing peacefull weekend, very cosy charming cottage, we would definatly stay again. Thankyou. Our "go to place" in Auckland. Our "go to place" in Auckland. One of the best holiday homes we stay in. Comfortable, quiet, scenic and very clean.Great value for Auckland. This cottage has been beautifully restored and was situated in an awesome location - rural outlook but so close to civilisation as well.